The first time you smell a fragrance or essential oil out of the bottle is definitely memorable. A fragrance can immediately inspire designs, colors and additives for your next soap recipe. But, sometimes the fragrance and essential oils can fade or change in cold process soap. The pH level of cold process soap can attack components of the oil, causing them to smell differently. It can be very disheartening! All Bramble Berry fragrance and essential oils are tested to ensure the scent sticks to cold process soap for months after making the soap. That being said, there are tips and tricks to make scents last even longer. How much fragrance or essential oil used in the recipe plays a big role in scent retention. For a strong scent, with regulations taken into account, you can add .8 ounces of fragrance or essential oil per pound of cold process soap. For melt and pour, you can add .25 ounces of essential oil per pound, or .5 ounces of fragrance oil. This number will vary based on the scent selection. For instance, Almond Fragrance Oil is on the stronger side. Just .16 ounces per pound of cold process soap will provide a hefty scent. 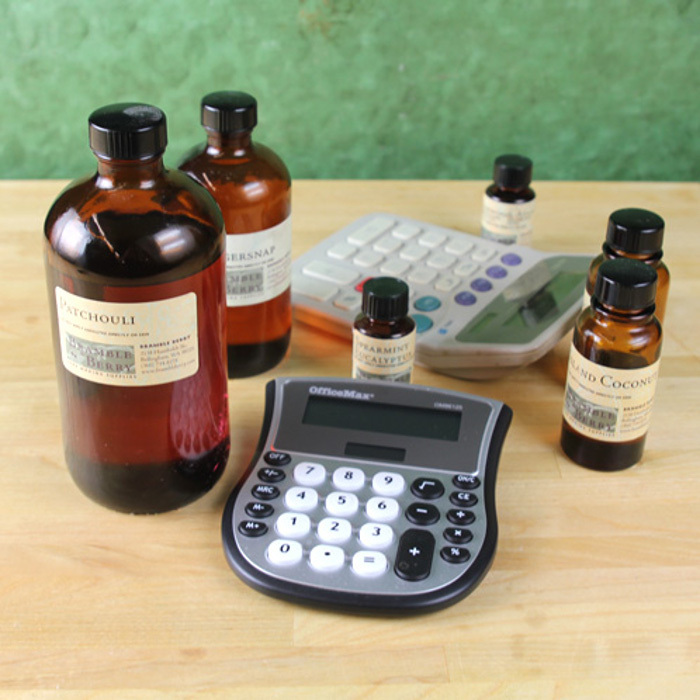 To find out exactly how much to add to the recipe, check out Bramble Berry’s Fragrance Calculator. Find out how to use the calculator here. 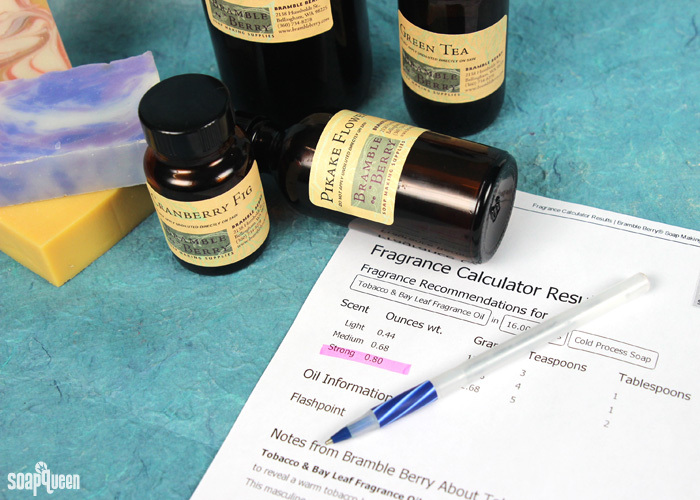 The Bramble Berry Fragrance Calculator amounts are based on safety guidelines created by IFRA (International Fragrance Association) and RIFM (Research Institute for Fragrance Materials). Each fragrance and essential oil have a maximum usage rate that is deemed safe for bath and beauty products. The “strong,” amount of fragrance recommended by the calculator is based on this maximum usage rate recommended by IFRA and RIFM. Using more than this amount can cause skin irritation. Even with the highest scent recommendation, some scents don’t make it through cold process soap making. Cold process is a harsh environment, as it goes through several pH changes. Coconut scents, like Coconut Cybilla Fragrance Oil, can be very light in cold process soap. This is also the case for citrus essential oils, like Lemon Essential Oil and Orange Valencia Essential Oil. Still want a coconut or orange scent that lasts? You can use Coconut Cream Fragrance Oil or 10X Orange Fragrance Oil. Check out the tutorials using those fragrances below. Don’t give up on citrus or coconut scents just yet! They work great in melt and pour soap and other bath products, like the Coconut Oil and Pink Salt Scrub. That tutorial uses Island Coconut Fragrance Oil and Lime Fragrance Oil. You can also anchor light scents. That involves pairing them with a deeper, earthier or more complex scent to “anchor” the fragrance in soap. Some examples of anchoring scents include Amber Fragrance Oil, Patchouli Essential Oil and Sensuous Sandalwood Fragrance Oil. In the Lime in the Coconut Milk Cold Process Soap, Lime Distilled Essential Oil was paired with earthy Coconut Lemongrass Fragrance Oil to help it stick. 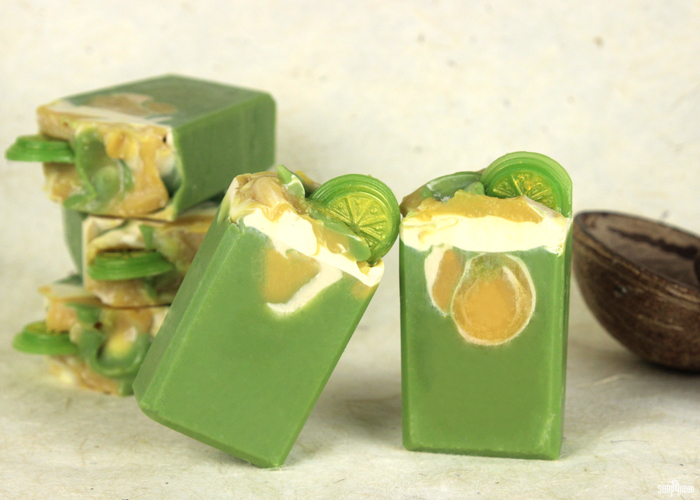 This Lime in the Coconut Milk Cold Process Soap uses earthy lemongrass to anchor the lime scent. 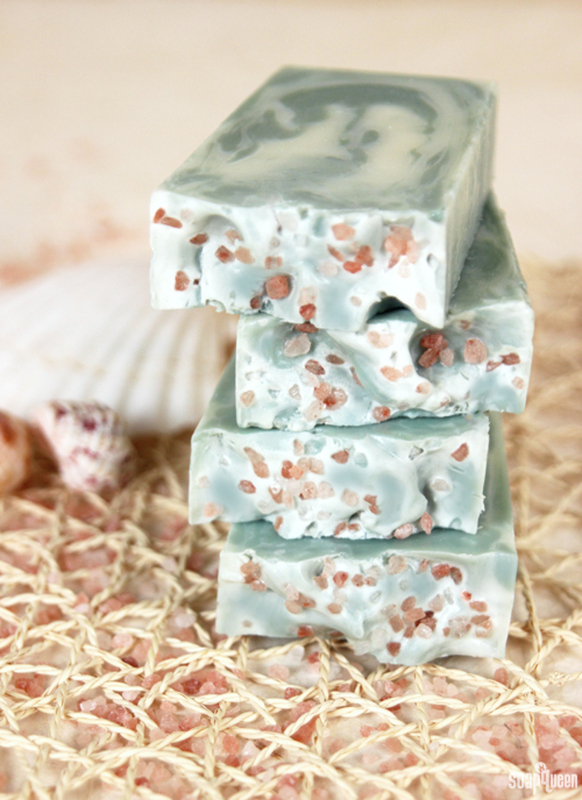 Some soapers like to use kaolin clay in their soap to help hold scent. While we haven’t done a lot of scent testing with kaolin clay, we have found it adds a nice “slip” and subtle color to soap. Kaolin clay was used in the Sea Clay Swirl Cold Process Soap. To add it to your soap, mix 1 tsp. of clay in 1 Tbsp. of distilled water beforehand. That helps it disperse evenly. It also prevents clumping and acceleration, as clays tend to absorb moisture. Read more in the Sunday Night Spotlight: Brazilian Clay. Kaolin clay gives the Sea Clay Swirl Cold Process Soap a subtle white color. Temperature is another factor to consider when soaping. Each fragrance and essential oil has a flash point, which is the temperature at which, under certain circumstances, the liquid in question can ignite with a flame. This means the liquid needs to be at the flash point temperature and come in contact with an open flame. Some people believe if a scent is heated to the flash point temperature in recipes, it can cause the fragrance to fade. We haven’t noticed substantial scent fading at higher temperatures, but it is something to take into consideration. If you’re using a low flash point scent, you may want to avoid gelling the soap. During gel phase, soap can get as hot as 180 ° F. Read more about gel phase here. It may be something to consider when making hot process soap as well, as the soap temperatures are typically around 160 ° F or hotter. Some soapers only use medium or high flash point oils when making hot process soap, like the Marbled Clay Hot Process Soap. To ensure the scent stays strong during the cure, store it in a cool, dry place that’s not in direct sunlight. Learn more about storing your products here. You can also dip a cotton ball or balled up paper towel in the fragrance or essential oil and place it by the soap while it’s curing. That is thought to help the soap “absorb” some of the scent as it cures. Just remember that fragrance oils and plastic do not get along, so be sure your cotton ball is not sitting on a plastic surface. Click here to read more about how plastic and undiluted fragrance oils don’t mix. Storing your soap in a cool, dry place out of direct sunlight can help that scent stick. For the best scent retention, make sure the fragrance or essential oil you’re using has been tested thoroughly and is approved for use in soap. We test all of our scents and include performance notes in the essential oil and fragrance oil descriptions. Do you have any tricks for making scent last? Personally, I like to scent my soap recipes on the stronger side to ensure my fragrance really comes through. I am very new to cold process and my question is do I need to add EO and FO both to the soap? I understand that FO is only for the fragrance and EO is also for the therapeutic benefits. But is EO enough if I’m looking for mild scent too and if I skip the FO. I am really not happy that my coconut mango FO I purchased from here vanished in my soaps. Now I have un-scented cup cake soaps and soap bars. I waited until the temps were around 125 before adding. So what happened? I’m sorry about that Shandy, when we tested that fragrance we found it stuck well in cold process soap. How much did you add to your batch? Do you have any recommendations on using diatomaceous earth (food grade, of course) in melt & pour soap? Or collagen? Would you use the collagen powder that you can mix in your juice in the morning or would I need to use a different grade? Looking to use things in bars that are beneficial to the skin. Thanks! Hi! I just had a problem with my coffee fragrance oil (locally bought here in our country) and it was a disaster. I’ve mixed my oil first then I added 2 teaspoons of Kaolin Clay, I mixed them well before adding my lye coffee. For the first 3 to 4 minutes of stirring, my batter (32 oz) was all fine so I decided to separate my batch into two. After that I’ve added the coffee fragrance oil(.8oz) to my main batter and while mixing it for about 5 minutes, little clumps formed everywhere…sound like RICING, right? However, the one I separated was sitting there just like nothing happened so I guess I know who is the real culprit. Now, am I using the FO the right way?? It cost me a lot for that. Can I mix the fragrance oil first with my base oils before adding the lye? Can I still use the soap when it clumps like rice (tapioca pudding)? P.S. I am not able to stick blend the soap until the ricing disappears. Hi these, I love reading all your articles. I’m new to soap making and I have an issue with my essential oils, I can’t get them to mix properly in the base, they stay separated and when the soaps set in the mould I have all the oil sitting on top in little bubbles. ( I have chosen goats milk melt and pour base). Any tips here would be a great help. Thanks, Staci. Hi!, I just made a few more batches and they still smell awful! They are all new bottles I just bought (BB) and there are no spots. What am I doing wrong:( my husband came home trying to figure out what the smell was 🙁 the only oils I use on her olive oil coconut oil sweet almond oil grapeseed oil an avocado oil sometimes these are the only oils I have is it one of these that’s causing my problems? I am new at soapmaking and i tried using the oatmeal milk and honey FO. the scent came out beautifully after i made the soap but completely faded after 2 weeks. i am now on the 20th day of curing and can hardly smell any scent on the soaps. i used 33% each of olive oil, coconut oil, and palm oil for a total of 900g of oils and used 45g of the FO. i wonder what happened. I’ve used B.B. Almond many times. I’ve never had it fade. Could be your recipe, or storage. I totally agree. I feel almost nose-blind sometimes to all the mingling scents. My customers can smell them just fine, but I cannot. Once a soap is cured should it be stored in a sealed or open container. I cant seem to find that answer anywhere? Thanks. 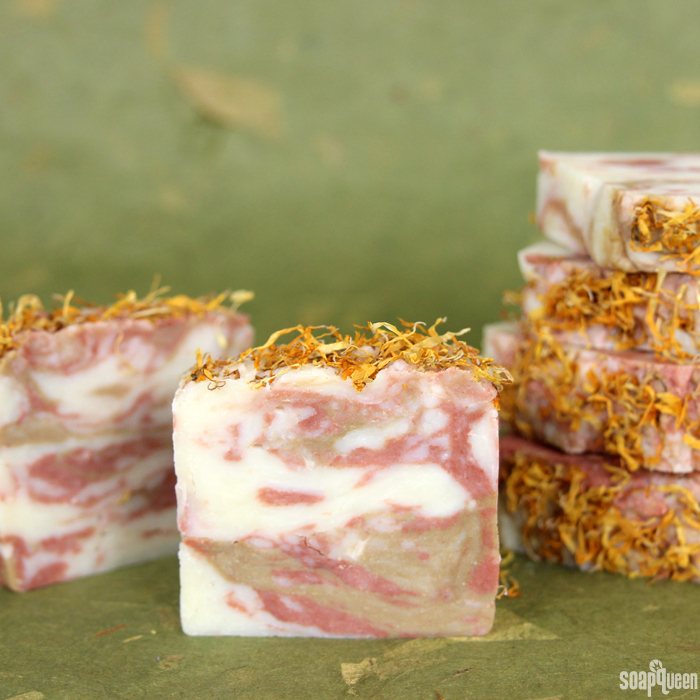 I want to make a Lemon Poppy Seed cold processed soap using lemon essential oil. Is there something I should add to hold the scent of lemon? Thank you. Any experience with the ratio to anchor? What would be the recommended % of patchouli in this situation? Thanks!! A small amount of Patchouli does definitely help to retain citrus scents. If I use 5 oz. of a citrus scent, then I use maybe only 1 teaspoon of Patchouli. It gives citrus scents a warmer smell. I’m wondering if it’s possible to use dendridic salt in the soap to help hold the fragrance. Maybe put the fragrance into the salt first. I know it works wonderfully in bath bombs and such and the addition of a bit of salt would produce a slightly harder bar, which is also a plus. You shouldn’t need to use too much. Just enough to hold the fragrance oil adding your super-fatting oils to that at the end of your trace. >> I haven’t tried it yet, but it sounds feasable to me. Holding soap fragrance is a concern for all of us and a great conversation. It’s something worth this discussion. I’m glad you addressed it. I love your fragrance oils and Energy is a favorite with everyone. I would like to make soap that scents your skin. I have found if I buy soap from various manufacturers it smells wonderful AND that scent clings to your skin. My cold process soap, lotions ( I bought a lotion kit from you last year and everyone loves the recipe…thick and creamy) and body butter smell amazing but the scent does not cling to your skin for very long. I am wondering if it is because the milled soaps add the fragrance after the saponification process. Is there something to add that makes the fragrance cling to your skin longer ? Our Fragrance Calculator amounts are based on IFRA (International Fragrance Association) guidelines. If you use more than the strong recommendation, it can cause skin irritation. I would recommend sticking within those guidelines. It is too bad that most coconut scents don’t make it through cold process soap making. That is definitely my favorite fragrance. I’m glad you offered some solutions so that I’ll still be able to make coconut scented handmade soap. I’ll check these tutorials out and if that doesn’t work I can always buy some online, thanks. I don’t know if this has been asked or explained before, I’ve been searching all night and can’t seem to find an answer to the issue I seem to be having. I’m still fairly new to soapmaking, I’ve made a little over a dozen different batches so far, I do cold process and I use fresh-frozen goats milk. Usually the oils I use are sweet almand, castor, palm, and coconut oil (and a few other variations), and I’ve been using fragrance oils… a different fragrance each batch. I just looked at my oils, and are no expiration dates on the tubs, though they look and smell fine. I contacted my supplier and waiting for a reply about when the dates would be, though the website guarantees good for one year after purchase and I only purchased them a few months ago. On these batches I did not use water, I used 100% frozen goats milk. And I stored them in my cellar, where it is a bit cool, and had my mold wrapped in a thin towel. There is no orange spots or anything on the bars, they are a smooth color all the way through, and the playdough smell is very mild. I’m wondering if it may be the milk instead! When the milk reacts with the lye, it creates an odd smell – it sort of smells like ammonia. As the soap cures for 4-6 weeks, that smell should start to fade away. Also, the good thing about that is the bars are still totally fine to use! I don’t know what it is, but I have that playdough scent too since I use three new things : mineral oil for lining my Milky Way mold to make unmolding easier, shea butter and cocoa butter in my soap recipes. Nothing else has changed since I found that playdough scent in my soaps. 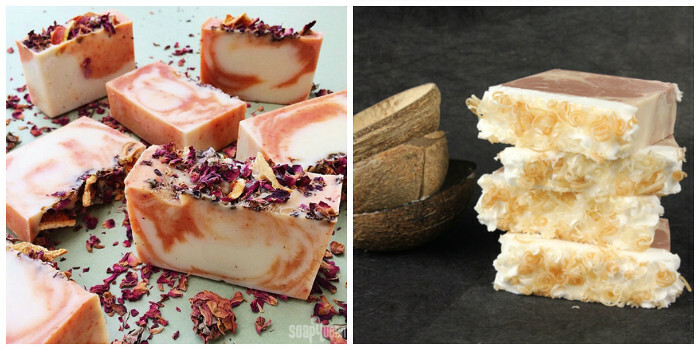 My oils and butters are not rancid and I didn’t either use milk in these soap recipes. Hope we could find what there’s in common and so find the source of the problem. I’m not entirely sure what could be causing that scent! We do find the soap gets an odd smell when it’s rancid, or has scorched milk or another liquid. Are you using any fragrance in your batches? I’m using essential oils. Maybe not enough but I never had this smell before. The playdouh scent seems to fade a little since the beginning of the cure, about two weeks. But it’s still there. I hope it will continues to fade and let the place to my essential oils scents! Today I try a batch with Milky Way molds lined with coconut oil. I will see if it can make a difference. I would recommend making a small test batch without the essential oil to see if you still notice that scent. If it’s still there, you may try one recipe without the cocoa and one without the shea. That way you can find out if any of those are causing the smell! I’ve had that smell in my soaps too. I call it “The Soap Stink”. It happens a lot with oatmeal, milks and even beer. It doesn’t matter which base oils or essential oils I use, it just seems to be there sometimes. But once the soap is fully cured, the stink always goes away. So my advice would be to just leave it to cure for a few weeks. I know these comments are older, but I hope this helps. I’ve been soaping for several years now. I make mostly goat milk soap. The play dough smell is VERY normal. It is almost a bit like ammonia which always goes away during cure. It is just part of the saponification process. Some of my recipes and fragrance combinations have it stronger than others. I also noticed that my 10lb logs have it worst at cutting time on the surfaces that have not yet been exposed to air. But again, it does disappear usually in the first week or two of cure and the expected fragrance settles in nicely. My question is kind of the opposite of holding scent and more about how it fades or how I might bring it down a bit. I made my first loaf cold process oven process with rose water, rose infused olive oil, coconut oil, castor oil, a little jojoba and a little apricot oil. I also added a handful of rosehips and dried rose petals with rose clay. My issue is that I added too much essential oils. I was adding geranium, a little patchouli and lemon to enhance the rose… I used a fragrance calculator to tell me how much to use but had a problem with my scale not registering the weight as I added it to my mix. So, I ended up with a geranium bomb. It’s pretty strong after cutting into small sticks (1x1x3) several days ago. They are for a gift set and I’m afraid that they won’t mellow in the coming weeks. I’d hate to give away a crap batch. Do you think the scent will calm over time? Oh no, I’m sorry about that. I have definitely scented some of my batches quite heavily – I learned quickly that peppermint essential oil is quite strong! I was thinking of wrapping each bar in tin foil, but thought you might have some better advice. Those are going to make great Christmas gifts! I would recommend storing them in a cool, dry place with good air flow. That will keep those bars of soap fresh until they can be gifted. You can store them on a bakers rack, or in a plastic tub with the lid unsecured. When you are talking about using a base note to “anchor” a scent , how much should be used? And can you use essential oil and or fragrance oil? My question is…would sticking your soap in the fridge/freezer (not gelling) make the scents stay longer since its not going through the heat gelling phase? We store our soap all sorts of ways, depending on the recipe. That includes room temperature, gelling, fridge and freezer. As far as scent retention, we haven’t noticed a huge difference among the storage methods. I find gelled soap has similar scent retention to frozen soap. I think adding more fragrance and using one that sticks in cold process really helps. Does the soap smell different from when it being made and the final product? I mean, initially when the oils and lye are being mixed, it smells weird. Will it smell the same way after it is cured? How are you ? I rarely come across indians on soaping sites 😀 So I felt I had to try get in touch with you. Do let me know if you would like to discuss soap or if you found this extremely disconcerting. Hi bramble berry, this article will help me when I finally take the plunge and make my first batch of cold process soap, but I guess my comment is about bath bombs and bubble bars? My first test batch of bath bombs and bubble bars I made stopped smelling after about the six month period. So if anyone has any information about how to anchor scents better to this type of product I would love some input. So glad you found the blog post helpful! I do have one question, do different companies selll different strengths of fragrance oil? I live in Canada and much as I would adore to get all my fragrance oils from you afraid you aren’t able to ship them all to me. And when I have consulted other suppliers I have received such different responses about correct usage I really did wonder if some are diluted? Even if yours are not do you know if diluting them before sale might be a practice for some suppliers? Just curious since it does make calculating correct usage a bit tricky. I live in Toronto and order some of my scents from SaffireBlue.com. They are just of me and I have had great luck with my scents from them. The only one that totally disappeared was Cotton Candy, but this has happened with all cotton candy from other companies too. Try Saffire Blue out, shipping is very fast and they carry everything a soaper needs. Fragrance oils can vary from company to company! Our usage rates are based on International Fragrance Association guidelines. I would definitely recommend following the suggested usage rates from the companies. Because they test the fragrance oils, they most likely know the correct usage rate. There is some good information here. I wrap my soaps with bands and then store them in boxes to prevent scent loss also. One thing that confuses me is that you recommend 0.8 oz. per pound of SOAP for a strong scent. That would be 4 oz fragrance for a 5# batch of soap. I find that 0.8-1.0 oz. 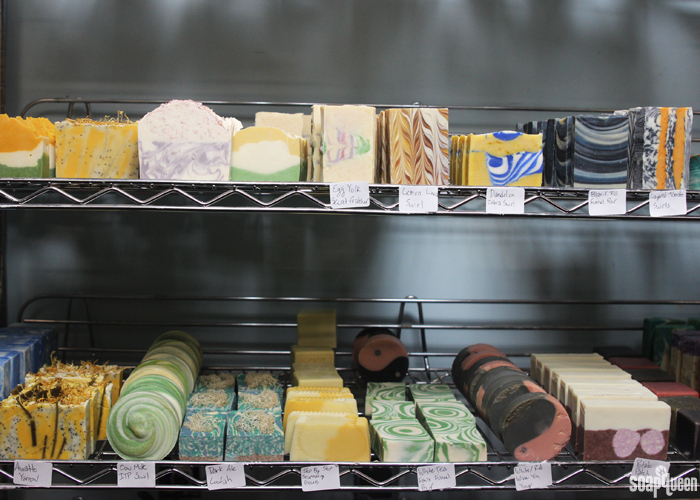 per pound of OILS, not total pounds of soap is plenty of fragrance. If you input 0.8 or 1.0 nto the SoapCalc lye calculator under fragrance amount for a 5# batch it gives 2.75-3.5oz of fragrance for 5 pounds. Is the fragrance calculator on Brambleberry’s site base meant to have the total pounds of soap entered or oils? I think this article says “per pound of soap” not “per pound of oils” is because you add the fragrance oil once the lye and oils have emulsified into soap batter, not just to the straight oils. Is that what you meant? Hi Vicki, Cadence and Robin! Kelsey – Some soapers discount their water when making soap, for a wide variety of reasons. However, the water eventually evaporates once the soap is fully cured. I am confused as to why your fragrance amounts would take into account the water weight because that could vary a lot depending on the water discount used. Why does BB based the amount on total soap weight vs. oil weight? thanks! I am now very confused.. you say it’s .8 per pound of soap which includes oil, lye and water.. but in SoapCalc only the amount of oil is used to determine how much scent to use. Actually.. when comparing Brambleberry Frangrance Calculator, it seems only the oils are being taken into account and does NOT inlcude the lye and water. I’m not entirely sure how SoapCalc calculates fragrance amounts, but I can tell you ours are the total weight of the soap, including oils, water and lye. Those are based on International Fragrance Association (IFRA) guidelines. Well, I was comparing your Brambleberry’s chart with SoapCalc and they are the same.. when using .5, .7, or .8 ppo..and i can tell you Soap calc only goes by total amount of oils because even if you change the amount of water or lye, the amount of scent stay the same..so, that tells me they only use total amount of oil. – and it so happens to match the amounts from your chart. I’m not too familiar with SoapCalc, but from what I understand you can change the fragrance amount to always be .5 ounces per pound, .7 ounces, etc. It seems to be a blanket amount they use for all fragrance. Our calculator is tailored to each fragrance! For instance, you can add up to .8 ounces of Blue Man Fragrance Oil per pound of cold process soap. With Lemon Verbena Yankee Type Fragrance Oil, you can add up to .2 ounces per pound of cold process soap. Those amounts are based on IFRA guidelines. If more of the Lemon Verbena is added, it can cause skin irritation. What I love about our Fragrance Calculator is it gives you a range of suggestions – light, medium and strong. That means you can use whichever one you like within the suggested usage rates! For instance, you can add .4 ounces of Blue Man to 1 pound of cold process soap for a light scent. If you want that scent to go a long way, you can use a nice strong one. For instance, Peppermint Essential Oil is quite strong! 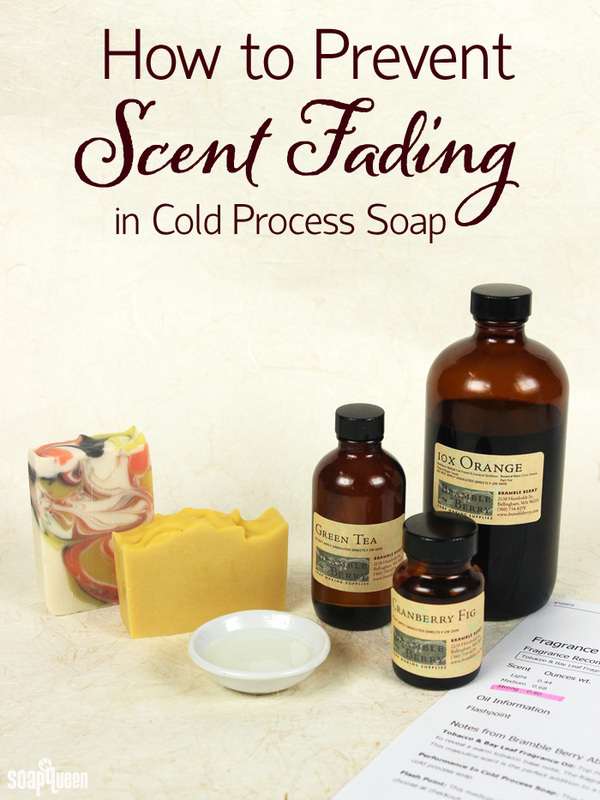 I typically only use a couple of drops per pound of cold process soap. oh wow.. ” a couple of drops of Peppermint per pound?” – omg.. I’ve used about .3oz ppo..is that too much?.. will it be irritating? For instance, I made a 65oz batch and used 2oz of EO.. 1oz Vanilla and 1oz Peppermint.. it smells really good, the peppermint is not too strong and it just smells great with the vanilla fragrance…but now, Im worried the 1oz of Peppermint might my irritating…what do you think? The Fragrance Calculator will tell you light, medium and strong recommendations! We don’t recommend going over the strong recommendation, as the Peppermint Essential Oil can cause a cooling sensation.